Jeanette Vorhis, wife, mother, and grandmother, died on Friday, November 30. She was born on January 10, 1917, and was preceded in death by her father Frank G. Hornback, her mother Celestine Orchelle Hornback, and her husband of 57 years, Robert Palmer Vorhis, who died in 1997. She is survived by a son, Stephen Robert Vorhis (Nancy), and a daughter Susan Jean Vorhis (Conrad Shiba); four grandchildren: Natalie Vorhis, Adam Vorhis, Meredith Edwards, and Sarah Vorhis; and by eight great grandchildren. 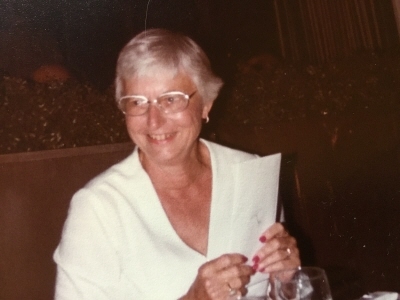 Jeanette lived a very long and full life, raising her family in Middletown, Ohio, where she did volunteer work in her children’s school, as a Girl Scout Leader, and as a Gray Lady at the Middletown Hospital. She enjoyed gardening, sewing, and traveling with her family. After her husband Bob's retirement from Armco Steel Corporation, they relocated to Punta Gorda, Florida, where they lived for the next 30 years. They enjoyed their retirement by traveling, sailing, and visiting with their children and grandchildren. In 2005 Jeanette moved to Tallahassee, Florida to be near her son, and in 2011 she moved to Danville, Kentucky to be near her daughter. "Email Address" would like to share the life celebration of Jeanette Hornback Vorhis. Click on the "link" to go to share a favorite memory or leave a condolence message for the family.